A long time ago — in the summer of 2001 if I recall correctly — I ran into an intriguing page at http://chaos.yerbox.org/face/ (Chaosmachine’s more recent page can be found at blamcast.net). The original page, which sadly resides only in the web archives nowadays, was all about this hidden “demon face” in one of Aphex Twin‘s tracks, #2 (the long formula) on “Windowlicker”. This face was supposed to be viewable with a spectrograph program, so I decided to try it myself. 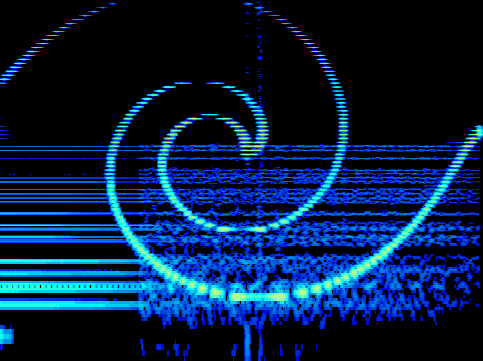 A spectrograph basically visualizes the sound spectrum. First I needed to extract the track from the Windowlicker CD, which was easy with CDex. The extraction of the whole track was not really necessary because the “face” is situated at the very end of the track, starting from the 5:27 mark and lasting for about 10 seconds. 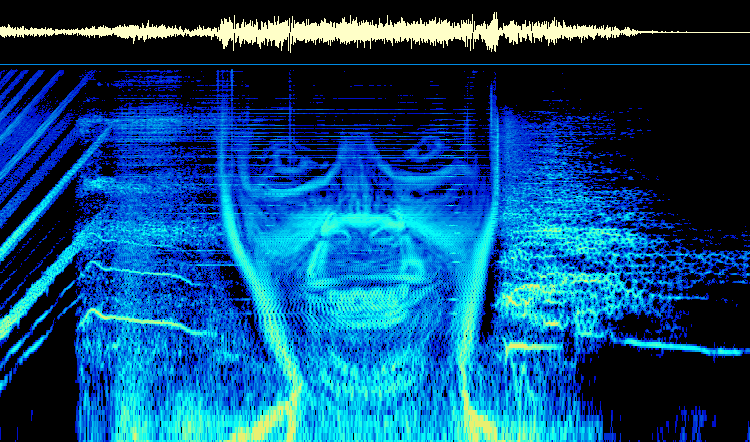 There are other “audio images” on this particular track as well (and one at the end of the first track), but the face is certainly the most exciting of them all. While examining the image, I came to the conclusion that something was not right. 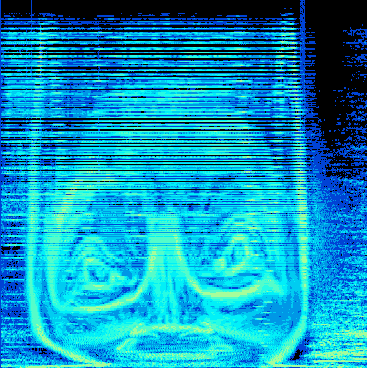 So I started messing around with the settings of the spectrograph program, and after a bit of knob twiddling the mystery revealed itself: the face was supposed to be watched with a logarithmic frequency scale, not with a linear scale. Why, it was none other than the Twin himself all the time, complete with his patented grin! After this “amazing” discovery, I contacted the guy at chaos.yerbox.org and informed him of the results. He seemed interested to add this new-found info to his pages, but I suppose he never got around to actually do it — which is the primary reason for the existence of this particular page. Next, I decided to inform the good folks on the IDM mailinglist about The Face. It turned out that this “picture to audio” -thing was really not hard to do at all and there was a Windows program called Coagula that could transform any picture into soundwaves with minimum effort. Aphex Twin himself had used a Mac program called Metasynth to do his images. I tested Coagula and found it easy enough to use. Now this new discovery raised a new question: Were there more examples of this audio imaging available? Luckily the soundscapes that Coagula spits out are quite easy to notice in their aural form, so I didn’t have to look for long before I found another example: On Plaid‘s “Rest Proof Clockwork”, the track “3recurring” contains a continuous stream of “threes” (as seen on the cover art of their previous album, “Not For Threes”). Besides the Plaid discovery I couldn’t find any more examples of audio imaging on any of the CD’s I own, but I didn’t bother to look that hard either. However it is clear that this audio/image stuff was “hip” at 1999, since both of the aforementioned records were released around that time. After going public with my pages, I’ve had several people contact me to offer more information on the subject or wanting to get an interview. The most prominent one was the story run on Wired Magazine (a well-researched story, but they got my age wrong by 6 years). Wave mural at the end of track #1 on Aphex Twin's "Windowlicker"
Extract of Plaid's "3recurring" from "Rest Proof Clockwork"
extract of Venetian Snares' "Look" from "Songs about my Cats"
haha good thing to know, im going to try this with my own tracks. quite insteresting, thanks for sharing. Very interesting indeed, I was totally unaware of all of this. Dig aphex twin though. Had you going? This isn’t a joke. We learned about these possibilities when I was in grade school, at least as far back as the late 90’s. Less sophisticated versions were made long before. Its as simple as having a visual representation for each sound. Put these in a pattern and you have a recognizable image that can be as sophisticated or as simple as the creator’s abilities and resources will allow. The cat picture is almost certainly real. yes! just think of it as a musical box barrel. This is quite extraordinarily awesome. 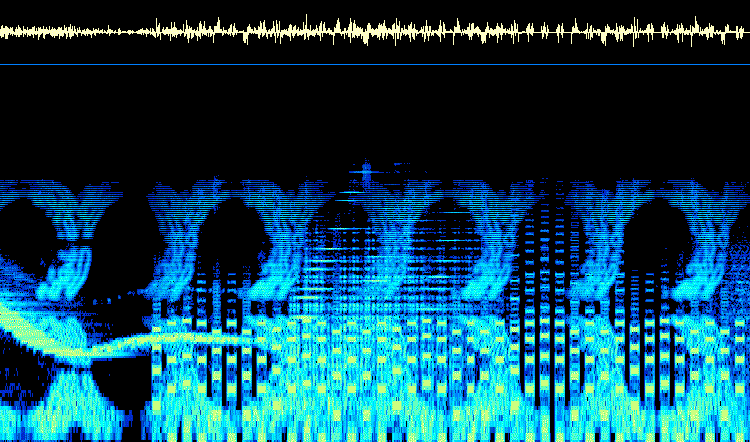 Sectrograph, the equivalent to Spectrogram, only for mac os x, did not work. Is there any other visualizing software for mac i can use? There are more of course. Using Coagula and still can’t get my images to show. Making a noise album with a lot of pictures and songs. Should be interesting, but I need to get this to work first haha 😛 Any tips? What effect does creating the image have on the music? Listen to the tracks and you shall hear…. 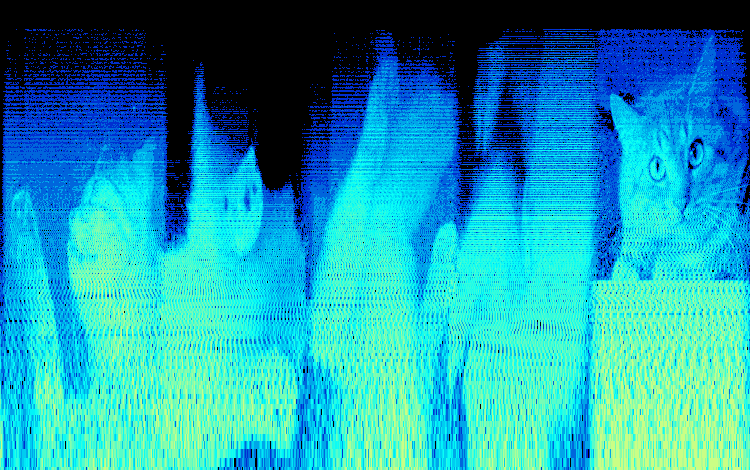 the spectrogram is the representation of all the frequencies in time of the sound . 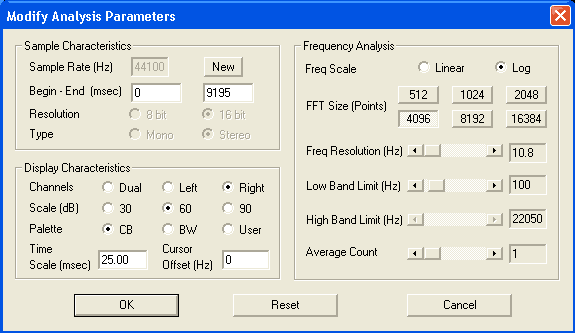 The more pale the color is, the more intensity these frequencies have. for example, the cat drawing sound pretty experimental/ not melodic …. you can listen to it and realise it by yourself ! And demonface STILL gives me nightmares.